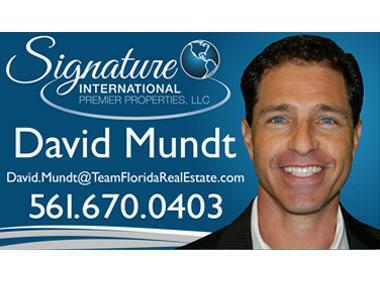 David Mundt continues to enjoy extraordinary success in the Ultra Luxury Real Estate market. Recently awarded the prestigious award of being the #1 Realtor in Sales Volume for the company, David provides proven results for both Sellers, Investors and buyers! Life as an entrepreneur has allowed him to apply his keen sense of analytics along with sharp negotiation tactics in order to close deals fast! Setting records seems to be a constant. He has been noted for selling property for the highest price per sq. ft. since 2007 as well as bring buyers in as little as 1 day! Originally from Pittsburgh, Pennsylvania, David came from humble beginnings. Working since age 13 in his family’s Hardware Store, he went on to open 2 more companies before co-launching a software company that was founded in 2000 and sold in 2007. His extensive knowledge of IT development and Database management allows him to set realistic expectations in all of his Real Estate transactions. David was asked to join “Signature International Premier Properties” in 2014 and has quickly proven to be an incredible addition to an already exceptional team serving the Luxury Real Estate Market.